The Criterion Blu-Ray of Stanley's Kubrick's classic war film looks absolutely fantastic. The 16x9 TV enhancement, though it actually crops a portion of it's 1.66:1 frame, adds a wonderful new full screen look of spectacle missing in previous DVD versions of the film. It's one of Kubrick's most important films, with the exception of Spartacus, it's his most sentimental, a film with a clear humane message, that said, it’s still laced with Kubrick’s cynicism and indictment of human frailties. It also features the same kind of truncated narrative structure he would employ in 2001: A Space Odyssey and Full Metal Jacket. The first half occurs almost exclusively on the front, either in battle or preparing for battle. The second half plays out either in the immaculately decorated aristocratic palaces of the haughty French generals, or in the halls of the kangaroo court where the fates of the three poor souls chosen to represent the cowardice of the regiment are determined. Kubrick’s command of both the huge spectacle of action in the celebrated Ant Hill attack scene and the intimate and intellectually stimulating dialogue scenes between the characters showcase everything of what the great filmmaker will accomplish in his career. Texture in the battle scenes is astonishing. Those lengthy tracking shots of Dax confidently walking to the demarcation point before the battle is mesmerizing to watch. As well look around at the detail in the background and the atmosphere of smoke, debris and the booming sounds of the artillery fire which blanket the soundtrack. Paths of Glory also lays the foundation of Kubrick’s visual aesthetic, or his stylistic language which he would hone, reuse and arguably steal from himself numerous times throughout his career. For the first time we can see how Stanley Kubrick’s sees the world, through wide angle lenses, following his characters on his dolly through the trenches of the Western front. Same with the classically designed interiors of the Chateau where the trial takes place and where in safety the smug General Broulard conducts his war. When we watch the scene where Dax approaches Broulard about Mireau’s heinous actions in the battle, the Johann Strauss waltz which plays in the background brings to mind the dance of the space station in 2001: A Space Odyssey a decade later. Kirk Douglas provides a typically heroic and righteous performance as Dax. But arguably the best performance is George Macready as the stubborn and opportunistic General Mireau who is supremely villainous. Mireau bridges two levels of conflict - General to General, as in the opening scene with the passive aggressive General Broulard; General to Colonel as in Mireau vs. Dax. The third level of conflict exists from Lieutenant to Corporal, represented by the complex relationship between Lt. Roget and Cpl Paris. The opening scene is especially important. When approached by Broulard about attacking the Ant Hill, we actually see Mireau heroically champion his men saying, ‘I’m responsible for these men…etc’, and even when offered the promotion he’s hesitant and aware of the optics of such a post at the expense of the confidence of his men. And then he instantly switches to an unconscionable tyrant for the rest of the film. Curiously we never get to see that warm character from the opening scene. This contradiction in character is at the core of Kubrick’s argument. The fact is, no one is fully to blame for the atrocities of war. In war sacrifices must be made. We never know who had given General Broulard the order to attack the anthill and thus pass the order to Mireau and thus pass the orders to Dax. 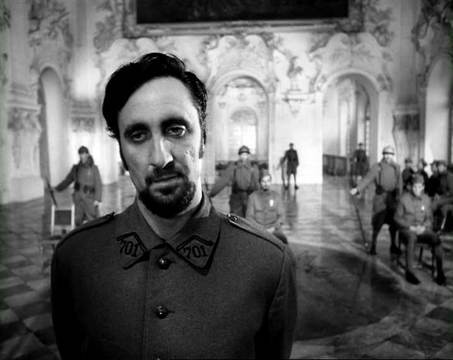 The chain of command is infinite up to the top, through Kubrick is sure to show us where the buck stops, at the bottom with the fate of the three executed soldiers.